In Good Day: The Paul Harvey Story, author Paul J. Batura follows the remarkable life of one of the founding fathers of the news media. Whether he was covering racial tensions, terrorist attacks, or which vitamins to take, Paul Harvey articulated the American experience for average people "in dime store words," with a deep sense of optimism, faith, and patriotism. 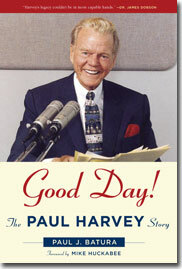 Featuring a foreword by Mike Huckabee, Good Day is the only biography of its kind; Good Day is Harvey's story, the rest of the story, as he would tell it himself.